Established in 2005 in Vancouver, Canada, the Dalai Lama Center for Peace and Education is inspired by the Dalai Lama’s vision for 21st century education. His belief that a balance between educating the mind and educating the heart will help create a more compassionate and peaceful world is the cornerstone of the Center’s mission. The Center is a non-religious, non-political charitable organization governed by a Board of Trustees. We work to inform, inspire and engage the adults who care for and teach children in homes, schools and community learning environments. By sharing current research, scientific knowledge, resources and best practices related to social and emotional learning, the Center is a leading advocate for change in how we educate our children. Compassionate children in a peaceful world. Educate the hearts of children by informing, inspiring and engaging the communities around them. Our programs and events help create learning environments and supports that enable positive human qualities such as compassion and caring in children and youth. Our ground-breaking Heart-Mind Index (HMI) has been developed in partnership with UBC’s Human Early Learning Partnership. The Heart-Mind Index provides a population-level measure of social and emotional development (SEL) in groups of children. The DLC facilitates community dialogue about the HMI data and encourages collaborations to improve early childhood learning environments. 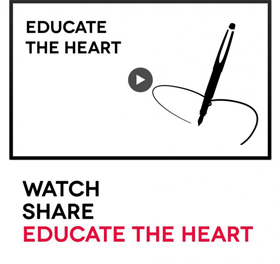 Our website Heart-Mind Online was developed in partnership with the Province of BC and brings together the latest research, success stories, learning resources and best practices to promote Heart-Mind Learning in formal education, community learning environments and family services. The online resource was launched during the Dalai Lama’s visit in October 2014, and we are continually developing new evidence-informed learning resources to support parents and educators. Our popular Speaker’s Series and annual Heart-Mind Conference bring together world-renowned researchers, scientists, educators and change-agents to share the latest developments in social and emotional learning, neuroscience, child psychology, public health and education. Since being founded, the Center has hosted the Dalai Lama in Vancouver three times, in 2006 (Vancouver Dialogues), 2009 (Vancouver Peace Summit), and 2014 (Be the Village Dialogues). In addition to our ongoing programs, the Dalai Lama Center is a leading advocate for Social and Emotional Learning and we consult with all levels of government and international agencies to develop public policies that contribute to a more compassionate, inclusive and peaceful society. Our work over the last decade has attracted scholars, researchers and thought-leaders from around the world to share their expertise and contribute to our mission. Read more about the history of the Dalai Lama Center for Peace and Education. Help the Dalai Lama Center be a global leader for change in the 21st Century. If you would like to support us in this important work promoting peace, compassion and Heart-Mind well-being in BC and around the world, please see how you can get involved. Stay connected with us on Twitter and Facebook, or sign up for our Newsletter updates.